“The Planting of the Spectre” and “The Night of the Cloud Spectre” have both appeared in Mirror Dance, and a quick Google search of your name brings up a dozen more Crow Witch stories. Do you have a complete list of them available? Do the Crow Witch stories have a set chronology? The response to the Crow Witch stories has been great, much better than I ever expected. With the publication of my first novel, it is my hope that I’ll have the opportunity to put all the Crow Witch Stories together into an anthology. Cross your fingers!!! Until then, my website is mikephillipsfantasy.com, but I must confess that I haven’t gotten it up and running yet. When I do, I think listing out the Crow Witch stories would be a great idea. The only hesitation I have is that, like you say, the stories are scattered all over print publications and the web. Several have yet to be published. I’d hate to tease people with titles they wouldn’t be able to find. How and why did you begin writing the Crow Witch stories? Do you follow a similar pattern when writing all of them, or does each develop in a different way? This is going to sound strange but I have no idea where Miss Weigenmeister comes from. She started out as a minor character in a werewolf series I intended to write. She was going to be a sort of Gandalf with wings. Even before the first story was over, she had become the focus. I never wrote the werewolf series, but that character makes occasional appearances in the Crow Witch stories. With many of the stories, the Crow Witch was not originally the intended protagonist, but somehow made her way in anyway –Maybe she comes to rescue me from bad ideas. While in the writing, if not to suggest a mental instability on my part, it almost seems like she has a say in what happens. Sometimes I catch myself arguing with her in my head. In “Night of the Cloud Spectre,” we are introduced to Jenny Bracco. Jenny becomes an important figure in later stories, being both counterpoint and student to Miss Weigenmeister. Now that I’ve thought about it, perhaps Jenny is my way of putting myself into the story so I can have my say too. I love your characterization of Mrs. Weigenmeister—her dryly witty dialogue is especially entertaining, and something I look forward to in each Crow Witch story. Do you think Mrs. Weigenmeister’s personality develops and evolves from story to story, or does it remain stable? Her personality hit home for me right with the first story. From then, though we find out more about her past and her abilities, she is who she is. Spectres play a large role in both of the Crow Witch stories published in Mirror Dance. What exactly is a sepctre? Do you think the spectres in the stories are symbolic of anything outside of the story? Honestly, I use the word spectre because it sounds creepy. The spectres in both stories are creatures of unknown origin or nature, a sort of vampire/ghost/ghoul/zombie thing. In “The Planting of the Spectre,” my use of the spectre began with an image. I saw bony hands with long fingers reaching into the sky, being able to grab hold of the air and take flight. Usually, I don’t have an ending to a story until I write it; but in this one, the pumpkin had it in for him from the beginning. In “The Night of the Cloud Spectre,” the spectre is an evil creature that has been cursed to travel the world in cloud form during the day. This idea came to me as I was traveling in Michigan’s Upper Peninsula. It happened to be that I was coming up on the Lake of the Clouds, which is near where Miss Weigenmeister lives and all the Crow Witch stories take place. I saw a dark gray cloud set very low in the sky. The cloud almost seemed to follow the road into the mountains. I could imagine the cloud had purpose and intent, like something inside was watching everything going on around it. In my mind, the creature became predatory in nature. On the west side of the Porcupine Mountains is Lake Superior, so it was only natural and fitting that I dump the monster in the lake before letting him loose on the world at large. It may interest you to know that the park where the Jenny Bracco first encounters the Cloud Spectre is right there at the State Park, but I took the name for the park from Sunset Park in Petoskey, Michigan just because I like the name. JournalStone recently published your novel, The Reign of the Nightmare Prince. What can readers expect to find between the covers? Reign of the Nightmare Prince is a story about a young shaman. He is on his Jaribu, a spiritual journey, the last test he must pass before becoming an adult. But as he returns to his homeland, he finds all the villages destroyed, the people vanished. Rushing home, he finds his people in terrible danger and he must unite them against this unknown enemy. 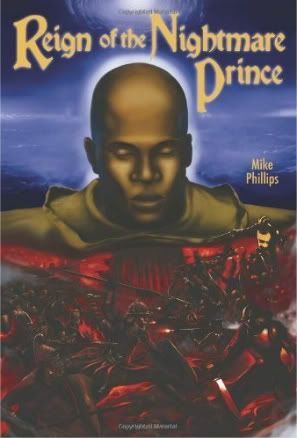 How did you develop the world and cultures in The Reign of the Nightmare Prince? While browsing a used book sale, I came across an old copy of Roots. I hadn’t read it in years, and thought the buck fifty was certainly worth the chance to read it again. During the first section, the idea of how a tribal culture reacts to a more sophisticated one fixed in my mind. From that starting point, I began to develop the idea of the young shaman, proving himself worthy, finding a terrible enemy stands against him and his return home. Many African cultures and traditions have colored my writing, even to the extent of using some Swahili words in the text. I find that my writing is strengthened by taking known cultures and myths and working them into my own work. Many writers do the same. I have done some study on how human cultures develop and use that in creating my world of the Nightmare Prince. Please forgive me for sounding so technical, but I am a bit of a book worm. There is a theory that likens human culture and development to ripples in a pond. Throw a stone into a pond and concentric circles form. So too, goes the theory, is human advancement. There is an idea or discovery and that idea is shared in waves from the point of origin. So when Rakam comes home, we start out in the backwoods and work our way into the capital city, going from the primitive to the more advanced. From there it is my great joy to throw a monkey wrench into the plot. Beasts and wicked spirits of all kinds work against Rakam even as he tries to save the world they live in. Just when the reader thinks they have everything figured out, we are introduced to the antagonists, the ones that are causing all the trouble. This ties the story into a great big knot that is only sorted out in the final chapters. Where there any similarities between the writing processes for a novel and a series of short stories? What advice do you have for other writers attempting either? Both the short form and the novel form have their advantages. I must confess that I like to write what excites me. “Strike while the iron is hot,” the saying goes, and I find the same works for writing. The short format allows me to take more chances with my writing. I can try out characters, settings, styles, without a big commitment. The novel gives me a chance to better develop the puzzle of a plot and the characters within. I almost think writing a novel is easier because the characters and setting are already in place. A novel is such a big project, however, that I have to take a break from it every now and then. When I come back, there is always something new to discover. Publishing is an entirely different matter than writing. About ten years ago, I thought getting published would be pretty neat. So I started sending out stories. Most editors cut me to pieces. Some were encouraging. I started getting published in small journals. Even more importantly, however, I was writing stories I liked. With a finished novel manuscript, I found an agent. As naïve as I was, I thought I was set. But I never did have any luck with agents. Only when I started looking for publishers myself did I finally find Journalstone. So I guess my advice is, write what tickles you to write. Keep at it. If you are rejected, it’s not a big deal. Thank you so much for doing this interview! Is there any other news you’d like to share with readers before we go? Thank you for having me. I hope your readers enjoyed the Crow Witch stories as much as I enjoyed writing them. Take care! M. Arkenberg is the editor of Mirror Dance and its sister publication, the historical fiction e-zine Lacuna. Her short fiction and poetry have appeared in Beneath Ceaseless Skies, Ideomancer, Fantasy Magazine, Clarkesworld, and dozens of other places.